State the grand unified theory. Describe the principle of quantum chromodynamics. Present quests to show that the four basic forces are different manifestations of a single unified force follow a long tradition. In the 19th century, the distinct electric and magnetic forces were shown to be intimately connected and are now collectively called the electromagnetic force. More recently, the weak nuclear force has been shown to be connected to the electromagnetic force in a manner suggesting that a theory may be constructed in which all four forces are unified. Certainly, there are similarities in how forces are transmitted by the exchange of carrier particles, and the carrier particles themselves (the gauge bosons in Chapter 33.4 Table 2) are also similar in important ways. The analogy to the unification of electric and magnetic forces is quite good—the four forces are distinct under normal circumstances, but there are hints of connections even on the atomic scale, and there may be conditions under which the forces are intimately related and even indistinguishable. The search for a correct theory linking the forces, called the Grand Unified Theory (GUT), is explored in this section in the realm of particle physics. Chatper 34 Frontiers of Physics expands the story in making a connection with cosmology, on the opposite end of the distance scale. Figure 1 is a Feynman diagram showing how the weak nuclear force is transmitted by the carrier particle , similar to the diagrams in Chapter 33.2 Figure 2 and Chapter 33.2 Figure 3 for the electromagnetic and strong nuclear forces. In the 1960s, a gauge theory, called electroweak theory, was developed by Steven Weinberg, Sheldon Glashow, and Abdus Salam and proposed that the electromagnetic and weak forces are identical at sufficiently high energies. One of its predictions, in addition to describing both electromagnetic and weak force phenomena, was the existence of the , , and carrier particles. Not only were three particles having spin 1 predicted, the mass of the and was predicted to be , and that of the was predicted to be . (Their masses had to be about 1000 times that of the pion, or about , since the range of the weak force is about 1000 times less than the strong force carried by virtual pions.) In 1983, these carrier particles were observed at CERN with the predicted characteristics, including masses having the predicted values as seen in Chapter 33.4 Table 2. This was another triumph of particle theory and experimental effort, resulting in the 1984 Nobel Prize to the experiment’s group leaders Carlo Rubbia and Simon van der Meer. Theorists Weinberg, Glashow, and Salam had already been honored with the 1979 Nobel Prize for other aspects of electroweak theory. Figure 1. The exchange of a virtual Z0 carries the weak nuclear force between an electron and a neutrino in this Feynman diagram. The Z0 is one of the carrier particles for the weak nuclear force that has now been created in the laboratory with characteristics predicted by electroweak theory. Although the weak nuclear force is very short ranged ( , as indicated in Chapter 33.2 Table 1), its effects on atomic levels can be measured given the extreme precision of modern techniques. Since electrons spend some time in the nucleus, their energies are affected, and spectra can even indicate new aspects of the weak force, such as the possibility of other carrier particles. So systems many orders of magnitude larger than the range of the weak force supply evidence of electroweak unification in addition to evidence found at the particle scale. Gluons ( ) are the proposed carrier particles for the strong nuclear force, although they are not directly observed. Like quarks, gluons may be confined to systems having a total color of white. Less is known about gluons than the fact that they are the carriers of the weak and certainly of the electromagnetic force. QCD theory calls for eight gluons, all massless and all spin 1. Six of the gluons carry a color and an anticolor, while two do not carry color, as illustrated in Figure 2(a). There is indirect evidence of the existence of gluons in nucleons. When high-energy electrons are scattered from nucleons and evidence of quarks is seen, the momenta of the quarks are smaller than they would be if there were no gluons. That means that the gluons carrying force between quarks also carry some momentum, inferred by the already indirect quark momentum measurements. At any rate, the gluons carry color charge and can change the colors of quarks when exchanged, as seen in Figure 2(b). In the figure, a red down quark interacts with a green strange quark by sending it a gluon. That gluon carries red away from the down quark and leaves it green, because it is an (red-antigreen) gluon. (Taking antigreen away leaves you green.) Its antigreenness kills the green in the strange quark, and its redness turns the quark red. Figure 2. In figure (a), the eight types of gluons that carry the strong nuclear force are divided into a group of six that carry color and a group of two that do not. Figure (b) shows that the exchange of gluons between quarks carries the strong force and may change the color of a quark. The strong force is complicated, since observable particles that feel the strong force (hadrons) contain multiple quarks. Figure 2 shows the quark and gluon details of pion exchange between a proton and a neutron as illustrated earlier in Chapter 33.2 and Chapter 33.2 Figure 1. The quarks within the proton and neutron move along together exchanging gluons, until the proton and neutron get close together. As the quark leaves the proton, a gluon creates a pair of virtual particles, a quark and a antiquark. The quark stays behind and the proton turns into a neutron, while the and move together as a (Chapter 33.5 Table 4 confirms the composition for the .) 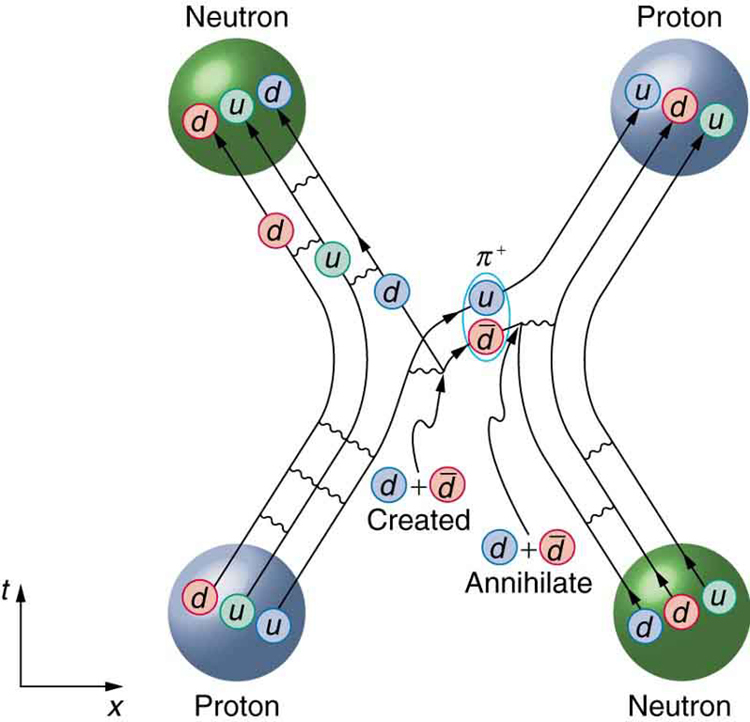 The annihilates a quark in the neutron, the joins the neutron, and the neutron becomes a proton. A pion is exchanged and a force is transmitted. Figure 3. This Feynman diagram is the same interaction as shown in Chapter 33.2 Figure 3, but it shows the quark and gluon details of the strong force interaction. It is beyond the scope of this text to go into more detail on the types of quark and gluon interactions that underlie the observable particles, but the theory (quantum chromodynamics or QCD) is very self-consistent. So successful have QCD and the electroweak theory been that, taken together, they are called the Standard Model. Advances in knowledge are expected to modify, but not overthrow, the Standard Model of particle physics and forces. Grand Unified Theory (GUT) is successful in describing the four forces as distinct under normal circumstances, but connected in fundamental ways. Experiments have verified that the weak and electromagnetic force become identical at very small distances and provide the GUT description of the carrier particles for the forces. GUT predicts that the other forces become identical under conditions so extreme that they cannot be tested in the laboratory, although there may be lingering evidence of them in the evolution of the universe. GUT is also successful in describing a system of carrier particles for all four forces, but there is much to be done, particularly in the realm of gravity. How can forces be unified? They are definitely distinct under most circumstances, for example, being carried by different particles and having greatly different strengths. But experiments show that at extremely small distances, the strengths of the forces begin to become more similar. 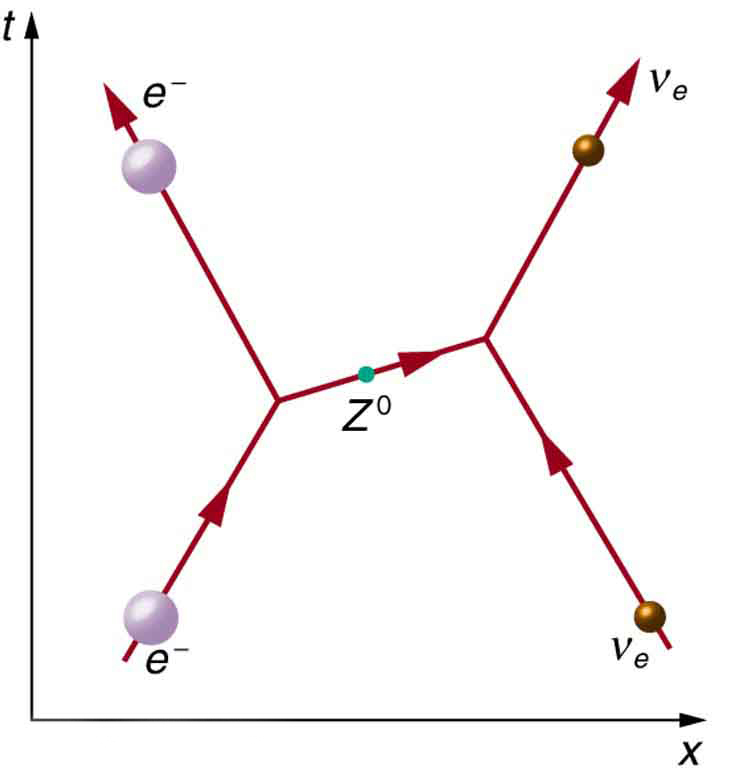 In fact, electroweak theory’s prediction of the , , and carrier particles was based on the strengths of the two forces being identical at extremely small distances as seen in Figure 4. As discussed in case of the creation of virtual particles for extremely short times, the small distances or short ranges correspond to the large masses of the carrier particles and the correspondingly large energies needed to create them. Thus, the energy scale on the horizontal axis of Figure 4 corresponds to smaller and smaller distances, with 100 GeV corresponding to approximately, for example. At that distance, the strengths of the EM and weak forces are the same. To test physics at that distance, energies of about 100 GeV must be put into the system, and that is sufficient to create and release the , , and carrier particles. At those and higher energies, the masses of the carrier particles becomes less and less relevant, and the in particular resembles the massless, chargeless, spin 1 photon. In fact, there is enough energy when things are pushed to even smaller distances to transform the, and into massless carrier particles more similar to photons and gluons. These have not been observed experimentally, but there is a prediction of an associated particle called the Higgs boson. The mass of this particle is not predicted with nearly the certainty with which the mass of the , , and particles were predicted, but it was hoped that the Higgs boson could be observed at the now-canceled Superconducting Super Collider (SSC). Ongoing experiments at the Large Hadron Collider at CERN have presented some evidence for a Higgs boson with a mass of 125 GeV, and there is a possibility of a direct discovery during 2012. The existence of this more massive particle would give validity to the theory that the carrier particles are identical under certain circumstances. Figure 4. The relative strengths of the four basic forces vary with distance and, hence, energy is needed to probe small distances. At ordinary energies (a few eV or less), the forces differ greatly as indicated in Chapter 33.2 Table 1. However, at energies available at accelerators, the weak and EM forces become identical, or unified. Unfortunately, the energies at which the strong and electroweak forces become the same are unreachable even in principle at any conceivable accelerator. The universe may provide a laboratory, and nature may show effects at ordinary energies that give us clues about the validity of this graph. The small distances and high energies at which the electroweak force becomes identical with the strong nuclear force are not reachable with any conceivable human-built accelerator. At energies of about (16,000 J per particle), distances of about can be probed. Such energies are needed to test theory directly, but these are about higher than the proposed giant SSC would have had, and the distances are about smaller than any structure we have direct knowledge of. This would be the realm of various GUTs, of which there are many since there is no constraining evidence at these energies and distances. Past experience has shown that any time you probe so many orders of magnitude further (here, about ), you find the unexpected. Even more extreme are the energies and distances at which gravity is thought to unify with the other forces in a TOE. Most speculative and least constrained by experiment are TOEs, one of which is called Superstring theory. Superstrings are entities that are in scale and act like one-dimensional oscillating strings and are also proposed to underlie all particles, forces, and space itself. which violates both conservation of baryon number and electron family number. Although is an extremely long time (about times the age of the universe), there are a lot of protons, and detectors have been constructed to look for the proposed decay mode as seen in Figure 5. It is somewhat comforting that proton decay has not been detected, and its experimental lifetime is now greater than . This does not prove GUTs wrong, but it does place greater constraints on the theories, benefiting theorists in many ways. From looking increasingly inward at smaller details for direct evidence of electroweak theory and GUTs, we turn around and look to the universe for evidence of the unification of forces. In the 1920s, the expansion of the universe was discovered. Thinking backward in time, the universe must once have been very small, dense, and extremely hot. At a tiny fraction of a second after the fabled Big Bang, forces would have been unified and may have left their fingerprint on the existing universe. This, one of the most exciting forefronts of physics, is the subject of Chapter 34 Frontiers of Physics. 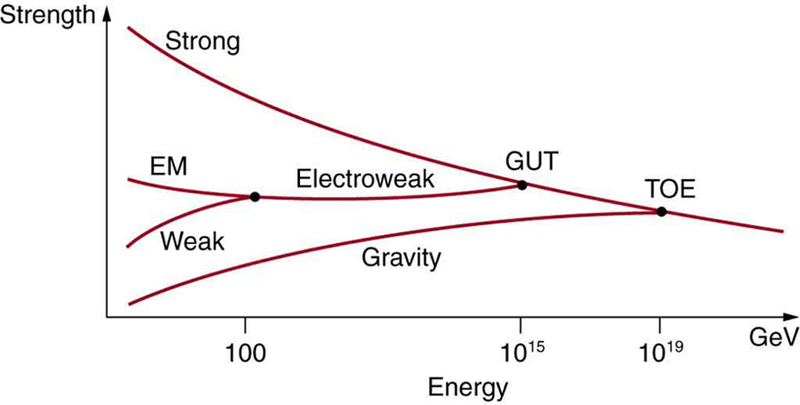 Attempts to show unification of the four forces are called Grand Unified Theories (GUTs) and have been partially successful, with connections proven between EM and weak forces in electroweak theory. The strong force is carried by eight proposed particles called gluons, which are intimately connected to a quantum number called color—their governing theory is thus called quantum chromodynamics (QCD). Taken together, QCD and the electroweak theory are widely accepted as the Standard Model of particle physics. Unification of the strong force is expected at such high energies that it cannot be directly tested, but it may have observable consequences in the as-yet unobserved decay of the proton and topics to be discussed in the next chapter. Although unification of forces is generally anticipated, much remains to be done to prove its validity. 1: If a GUT is proven, and the four forces are unified, it will still be correct to say that the orbit of the moon is determined by the gravitational force. Explain why. 2: If the Higgs boson is discovered and found to have mass, will it be considered the ultimate carrier of the weak force? Explain your response. 3: Gluons and the photon are massless. Does this imply that the , , and are the ultimate carriers of the weak force? 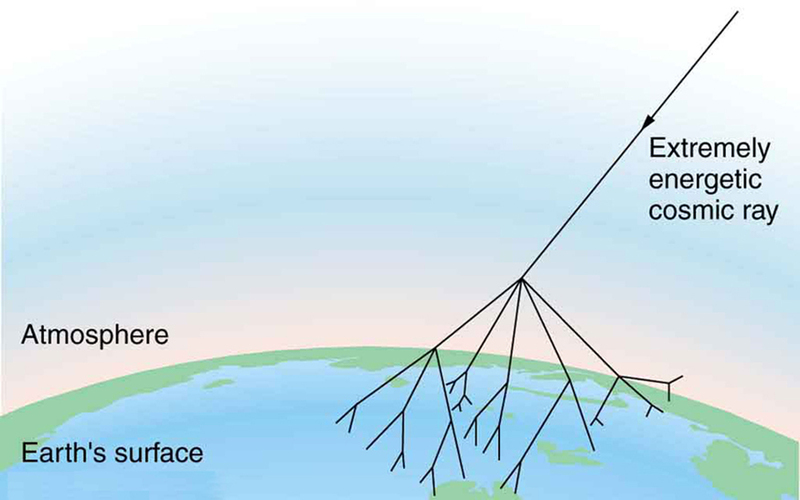 The intensity of cosmic ray radiation decreases rapidly with increasing energy, but there are occasionally extremely energetic cosmic rays that create a shower of radiation from all the particles they create by striking a nucleus in the atmosphere as seen in the figure given below. Suppose a cosmic ray particle having an energy of converts its energy into particles with masses averaging . (a) How many particles are created? (b) If the particles rain down on a area, how many particles are there per square meter? Figure 6. An extremely energetic cosmic ray creates a shower of particles on earth. The energy of these rare cosmic rays can approach a joule (about 1010 GeV) and, after multiple collisions, huge numbers of particles are created from this energy. Cosmic ray showers have been observed to extend over many square kilometers. Assuming conservation of momentum, what is the energy of each ray produced in the decay of a neutral at rest pion, in the reaction ? What is the wavelength of a 50-GeV electron, which is produced at SLAC? This provides an idea of the limit to the detail it can probe. (a) Calculate the relativistic quantity for 1.00-TeV protons produced at Fermilab. (b) If such a proton created a having the same speed, how long would its life be in the laboratory? (c) How far could it travel in this time? The primary decay mode for the negative pion is . (a) What is the energy release in MeV in this decay? (b) Using conservation of momentum, how much energy does each of the decay products receive, given the is at rest when it decays? You may assume the muon antineutrino is massless and has momentum , just like a photon. Plans for an accelerator that produces a secondary beam of K-mesons to scatter from nuclei, for the purpose of studying the strong force, call for them to have a kinetic energy of 500 MeV. (a) What would the relativistic quantity be for these particles? (b) How long would their average lifetime be in the laboratory? (c) How far could they travel in this time? Suppose you are designing a proton decay experiment and you can detect 50 percent of the proton decays in a tank of water. (a) How many kilograms of water would you need to see one decay per month, assuming a lifetime of ? (b) How many cubic meters of water is this? (c) If the actual lifetime is , how long would you have to wait on an average to see a single proton decay? Consider an ultrahigh-energy cosmic ray entering the Earth’s atmosphere (some have energies approaching a joule). Construct a problem in which you calculate the energy of the particle based on the number of particles in an observed cosmic ray shower. Among the things to consider are the average mass of the shower particles, the average number per square meter, and the extent (number of square meters covered) of the shower. Express the energy in eV and joules. Consider a detector needed to observe the proposed, but extremely rare, decay of an electron. Construct a problem in which you calculate the amount of matter needed in the detector to be able to observe the decay, assuming that it has a signature that is clearly identifiable. 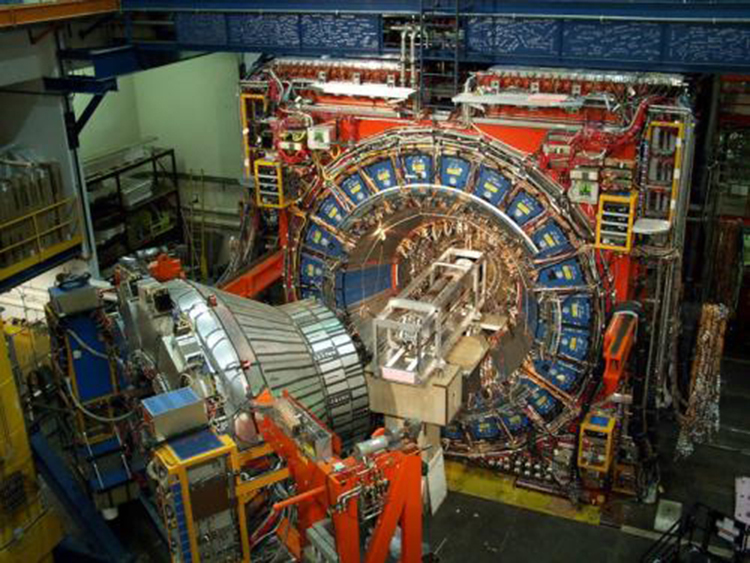 Among the things to consider are the estimated half life (long for rare events), and the number of decays per unit time that you wish to observe, as well as the number of electrons in the detector substance. Previous: 33.5 Quarks: Is That All There Is? 33.6 GUTs: The Unification of Forces by OpenStax is licensed under a Creative Commons Attribution 4.0 International License, except where otherwise noted.